Below you can view all the homes for sale in the Genesee Park subdivision located in Golden Colorado. Listings in Genesee Park are updated daily from data we receive from the Denver multiple listing service. To learn more about any of these homes or to receive custom notifications when a new property is listed for sale in Genesee Park, give us a call at 720-580-6937. Miles of Trails outside & easy access to I70 & Denver, Golden and Red Rocks! MLS#9480420. McClure and Associates. A full list of updates, video, and additional photos can be seen on the Virtual Tour. * MLS#3051399. HomeSmart Cherry Creek Properties. This home is located in the perfect location close to ski areas and the city! MLS#7521558. Discover Real Estate LLC. The master includes built-ins, a gas fireplace, large walk-in closet, 5-piece bath with jetted tub and steam shower. www.1713sandlilydr.info MLS#3975905. PERCH REAL ESTATE. Can't go wrong buying on this block with this fantastic piece of property! MLS#6046401. RE/MAX PROFESSIONALS. Conveniently located 30 minutes to Downtown Denver and less than an hour to world-class skiing. MLS#9833283. Keller Williams Foothills Realty, LLC. Have it all on top of the world! MLS#6835099. COLDWELL BANKER RESIDENTIAL 54. Call now to schedule your private tour! MLS#9394518. TRELORA. A beautiful pond to walk to, biking trails and so close to I-70 for a quick commute to Denver. MLS#3664306. LIV Sotheby's International Realty. Genesee offers 11 miles of hiking trails, 1200 acres of open space, 2 pools, 4 tennis courts & award-winning schools. MLS#9405829. Kentwood Real Estate City Properties. Walk-out lower level is unfinished to allow for your creative finish, excellent storage, workshop or play room. MLS#8673384. LIV Sotheby's International Realty. Walk-out offers open family room with dual I-beams, gas fireplace, 3rd bedroom, 3/4 tiled bath & glass front wine closet. 22.5' x 20' finished garage. MLS#6935563. LIV Sotheby's International Realty. Quick 25-minute drive to downtown Denver, perfect for your busy mountain lifestyle. MLS#8503841. Kentwood Real Estate City Properties. A huge bedroom, full bath, media & game rooms complete this level. 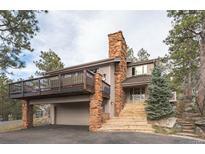 30 minutes to Denver MLS#5746792. RE/MAX ALLIANCE. And the icing on the cake is an awesome firepit deck to relax and enjoy the privacy & tranquility the lot offers while taking in the beauty of the spectacular sunsets! MLS#2264061. Kentwood Real Estate City Properties. Live the Colorado lifestyle you've been dreaming of in this exceptional home just minutes from downtown Denver * Gorgeous open floor plan drenched in natural light * Five bedrooms (including a main floor bedroom) * Five bathrooms * 5,278 Total Sq Ft * Main floor office w/fireplace * Great room with floor to ceiling windows and stone fireplace * Vaulted Ceilings * Lovely updated kitchen with granite counters, walk-in pantry and butler's pantry * Formal dining room * Front and back decks to enjoy the lovely outdoor spaces * Gorgeous five piece master suite with private balcony * Large finished basement with a bedroom, wet bar and fireplace * Three car attached garage w/large mud room * City and mountain views * Newer Roof (2017) * Newer Exterior Paint (2017) * This one is an absolute gem - hurry! MLS#9946606. OLSON REALTY GROUP. This is what Colorado living is all about! MLS#3536147. Kentwood Real Estate City Properties. Wonderful deck space to enjoy the views! MLS#1548424. LIV Sotheby's International Realty. Walkout basement is complete with family room, wet bar, 3 bedrooms, bathroom, laundry room, seasonal closets and an unfinished wine cellar. MLS#7587549. Fathom Realty Colorado LLC. Genesee is front range living at its best! MLS#9590929. Discover Real Estate LLC. Walk-out level has 3 bedrooms, media, family room & flex space. MLS#3682286. LIV Sotheby's International Realty. Also in this structure is an amazing greenhouse for those who love year -round hydroponic gardening. MLS#8470217. Kentwood Real Estate City Properties.